First Friends Preschool and Daycare is a family run facility that bases instructions on strong values and principles of family and friendships. We strive to offer peace of mind for parents/guardians knowing that they are leaving their children in capable hands as they go about their daily lives. "ALL CHILDREN ARE COMPETENT, CAPABLE, CURIOUS AND RICH IN POTENTIAL"
We are committed to providing quality child care and education in an environment that encourages the development of independence, social skills, self-confidence and responsibility while building upon the children's individual interests. We believe that early childhood education should be a time of discovery. Our goal is to engage children in experiences that stimulate their senses, mind and emotional well-being, while having fun and making their very own "FIRST FRIENDS"
First Friends Preschool and Daycare builds on the 4 foundations that children learn, grow and explore the environment provided to them. First Friends Preschool and Daycare supports and encourages positive and responsive interactions. These opportunities allow the children to interact with each other and communicate in a positive, meaningful way. First Friends Preschool and Daycare also promotes the health, safety, nutrition and well-being of every child enrolled in the program. The Health and Welfare of all the children is imperative by following the policies and procedures set out by First Friends Preschool and Daycare for each and every child, including our Sick Child Policy and Medication Policy. The safety of the children is of the utmost importance and is upheld by our Drop Off/Pick Up Policy, Accidents (major or minor) Policy and our Emergency Preparedness Policy. First Friends Preschool and Daycare believes that proper nutrition is important to a child's development, we ensure all children are provided a complete and well balanced menu with no limitations on the number of portions each child requests. First Friends Preschool and Daycare follows Health Canada's "Canadian Food Guide," and the Ontario Dietitians of Public Health - Paint your Plate program. All meals are prepared on-site by our cook. First Friends Preschool and Daycare is a Peanut/Nut Free Facility. 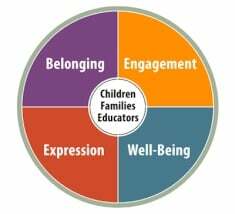 Well-Being is about children being confident, happy and healthy individuals, First Friends supports each child's well-being through our Transition Policy, Belongings Policy and Toilet Training Policy. First Friends Preschool and Daycare supports the full inclusion of children who have additional support needs of a physical, social or emotional nature. First Friends Preschool and Daycare supports families working with such agencies as, Erin Oak Kids, Kerry's Place Autism Services, Pirs and Brampton Caledon Community Living. Raising the Bar engages programs and educators in ongoing reflection and critical thinking to enhance quality in their environments through positive relationships. It provides a platform to increase a program's capacity to enrich their practices.